Pockets of fabulous Grateful Dead music are everywhere. As the number of shows you’ve heard increases, and you start filling in gaps, you come to find that sometimes distinctions can be made between the music this band was playing down to a month by month basis. Similar to the way I've often noted the characteristics tied to Summer ’73, there is a distinct aura to the music the Dead were playing in September 1972. In a tour running across the East Coast, the band played 11 shows over the final 16 days of the month. Part of that tour included a three night stand at the Stanley Theatre in Jersey City, NJ. There is so much fantastic music contained just in that three show stop, let alone the rest of the tour, that you can blindly grab any of these shows and always come out with some of the best Grateful Dead moments ever. You end up having to judge these shows against each other based upon how consistently hot the first set numbers were on each night – the set two jams being too consistently stellar to merit any level of heated debate. The September run provides a lovely example of the band morphing between playing styles. The Europe ’72 and Summer ’72 shows are recognizable for their enormously psychedelic jams that cook with a certain loping grace and intensity. That intensity boiled up come the Winter of 1972 such that in November the jamming could approach a teeth clenching, skin frying fervor, most notably evident in some of the late ’72 Playin’ In The Bands. 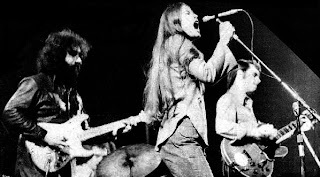 But September finds the band both in transition, and settled beautifully into a quintessential version of itself – the version that, regrettably, did not include Pigpen in the lineup (already falling ill and unable to tour) – a version that wasn’t as extreme in its raw-fire playing of the end of the year, while also an entirely mature and extended version of the magic born in the Spring of that year. The September 28th show at the Stanley Theatre opens with a Truckin’ (always a good sign!). It’s missing from the SBD, but patched in from an AUD here. After overcoming some SBD mix issues, this soundboard recording settles in nicely, and we are treated to a stretch of lovely first set tunes. The band sounds relaxed and focused. It’s a large show (running time of the tape pushes three and a half hours), and it remains a personal favorite because of its consistencies and beautiful highlights. Big River also had just debuted on this run, and it’s very fun to hear a early rendition tucked into a first set full of well developed songs. Playin’ In The Band spent the better part of 1972 maturing, slowly edging its way into a longer and longer jam. It wasn’t until September 1972 that the song reached the 20+ minute mark for the first time. The 9/28 Playin’ jam starts lightly, with everyone but Jerry laying the foundation of the groove. 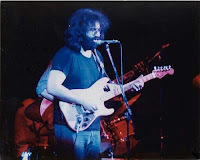 Garcia soon flutters in and begins to extend the coils of his great peppering staccato lead lines above the band. These 1972 Playin’s are a thing of beauty. Not the same as the Playin’s to come in the next year, these ’72 versions feel somewhat more concentrated. This one comes at you like a torrential rain, thick with colors bursting to fill the air around you, built upon the tightly wound interplay between the band members. The tempo isn’t any faster than it would come to be in 1973, yet everything has a more intensified resonance to it. 1972 Playin’s had this wonderful “speeding through canyons on horseback” feel to them, and 9/28/72 demonstrates this beautifully. The jam goes on and on, and every band member is delivering a top shelf performance. It’s not the first or the last time on this night that you will be blown away, in particular, with Bob Weir’s contributions. He’s Gone has this sweet, slow dripping jam where Jerry lobs his lead lines into the sky, allowing them to traverse mellow arching paths between the clouds. Bobby’s 1972 tone is probably as good as you could ever wish to hear it. His amplification and effects are full of splendid colors and rippling reflections – not the sometimes muted and buried mid-range restrain that his contributions could sometimes fall prey to on tape from this era. The delicate exist jam pours like sunlight beaming through thickly colored stained glass, turning the light at lazy dust-lit angles. Eventually Phil gets a solo, which winds its way into Other One. Other One appears, and it is one of titanic proportions, nearing 29 minutes *not* including the Me And Bobby McGee tucked within. It leads off with the band spinning an intricate weave of patterns, all tucking in and out of each other like an Escher-drawn knot. But what makes this Other One so special for me comes from the portions of the song that are not directly built around Other One at all. After the first three minutes, the majority of this jam reaches deeply into the same glorious structure easily recognized from “Truckin’ on the LP “Europe ’72” (actually from the 05/26/72 show). That Truckin’ exit jam, and what gets labeled on the album as “Epilogue,” are purely 1972 Dead music, and this jamming is fully explored here on 09/28/72. You just don’t hear this exact same playing style in other years. 1972 has so much going for it, but for me, of all its wonderful facets, nothing brings me more pleasure than this particular loose, buoyant jamming. It’s a rolling hills in a rich oil painted sky type of music . It has a certain ability to uplift my soul – truly joyous music. It’s interesting to note that there’s also no force or push by the band to make this jamming particularly psychedelic. It *is* psychedelic music, to be sure – Bobby works crazy phrasing that darts in and out of your head, Phil leaps throught notes as if weightlessly jumping from rock to rock across a river, Jerry carves spiraling, lyrical wheels of music that syncopate against everything else, Keith punctuates the underbrush perfectly, and deep in the jam makes tremendous use of his own wha-wha pedal on piano, and Billy nimbly drives the beat while allowing accents to escape in feathered refractions against his own steady path – but none of this comes across as contrived. It’s all far more natural. 09/28/72 delivers this most treasured jamming in spades. What makes this music so intoxicating is the clear sense that the band is allowing the music to settle itself exactly where it wants to go. In this place, the music finds its most rooted connection to inspiration. There is no call for sharp turns, or thematic heads, or death defying feats of cosmic acrobatics because this isn’t showmanship rock-n-roll. This is music of the heart which stretches across years and decades. We are listening to the living pulse of the Dead’s creativity. As the band’s music matured and evolved over the years, this was the doorway into their purest musical spirituality during 1972. You can feel the natural purity of the experience in the unforced playing. This jam had no starts or stops. In fact, it points to what is probably one of the most complex thematic undercurrents of the Dead, and one that I've yet to explore in writing: the slow evolution of their simply “playing” together. When we actually hear it, as in this Other One, we get the sense that we’ve managed to step passed a curtain revealing a precious place that’s always been there. It is because of this that the music can pull us so intensely in. It draws us to our own core as much as to the band’s. This is musical satori of the highest degree. As the music rolls along, the band slowly meanders directly into a nearly fathomless space. Sounds begin to stretch out quietly around us as Jerry plays a light solo line into the night under enormously protracted bass notes. From here, the Other One theme reemerges, and the music slowly mounts in energy through a fantastic few minutes of Other Onely-ness until reaching the first verse some sixteen minutes after the song started. It then drops right back into the beautiful theme based jam that came before the verse, and slowly edges its way down a twisted and thorny path. Taking this concentrated portion of the entire track as the real “Other One” song, it could easily be held up as archetypically perfect. The music starts to creep out of the corners at you, as if lightning soaked vines and mist are appearing out of thin air. All the while the deeply soulful jam is making itself known again, turning the music to and fro. Then there comes a shift into a sea of quaking lights and angles as the band delves into a corkscrewed space. After an onslaught of chaos which rends time and space from all moorings, setting reality adrift on a sea of clashing lava waves, the music settles and turns a corner into Me And Bobby McGee. 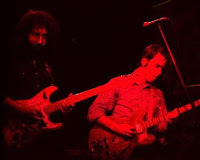 This is another version tucked into an Other One that sees Jerry’s solos tinged with a heightened energy pulled from the deep psychedelic proceedings. Also wonderful on this version are Garcia’s backing vocals. The brief respite from the complete meltdown is short lived, as directly out of the song we are dropped back into Other One for a solid ride through rhythms which turn on themselves like a ride through a rapidly turning kaleidoscope – all patterns feeding into each other, colors bleeding as if pushed by wind through leaves; the music courses into itself like a sea of snakes. This is textbook 1972 Other One here, rounding its way to the final verse of the song. If you’re going to fall head over heels in love with 1972, this is probably the show that will make it happen. It’s another poisoned arrow that will pierce willing flesh and bone, infusing the mind for life with a magic elixir. You’ll marvel that you hadn’t been exposed to this in all your currently accumulated years, and quickly come to surround yourself with as much of the stuff as you can. Thanx again...long been one of my favourites. noah, I'd be hard pressed to find a more effective description of this band's magic than your words about this Other One jam... as I read this, I thought "he could be describing 11/17/72, or 12/31, or 5/25, or 10/18, or..." Thank you for giving words to what 1972 makes me feel like when I listen closely. and I can't let this pass without comment: the way the Dead can move between the Escher-like intricacy of this jam to the gale force of the Greatest Story Ever Told in all of an hour's time is why they are a musical phenomena with few equals. This GSET never ever ever fails to get me to my feet. my second show - the first being 9/19/72 Roosevelt Stadium less than two weeks before. 16 years old. I was more into the "songs" back then then the monsterous jams - ah to be young and foolish !!! This was my first Dead show. I was 16 years old, and a buddy had an extra ticket that I gladly accepted. The Dead were already real popular in my little town in NJ (Cranford)...I had heard them plenty for a few years going back to Live/Dead, Workingman's, etc. A bunch of folks I knew were going to the shows of this three-day run in nearby Jersey City. But I had no idea what I was in for. The Stanley Theatre is a magnificent old movie palace (built in the 1930s?). And it was a monster show. It didn't take long that night before I know/felt I was in the presence of some very special, powerful energy. I walked out transformed...and from then on tried to see 'em as often as possible. Great input here you guys. This makes me think of a project I am working on. A review of the entire month of September 1972. Anyhow, just a dead forum. All are welcome. One thing we could use help on is the source review guide. We are trying to get to the bottom of which source for which show is the best, and we could use your help! It took me way too long to discover my favorite year for the Dead 1972. DP 36 is on my birthday so it seemed like destiny would guide me to that wonderful jam in the last few minutes of dark star before it reaches morning dew and forever hold me in the arms of the Grateful Dead. 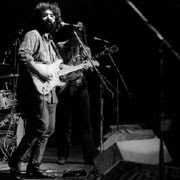 Haven't listened to this show yet but i know i will love it, Jerry's playing in '72 is perfect to my ears and Bobby impresses me more and more with each show. DP 11 is from this run, and remains my favorite GD release. 72 is the peak year, IMHO, because of the effortless quality of the long jams you describe so well here. It's some timeless territory we all know so intimately but access so rarely: the forever unfolding "now" we all live in. The Dead at their best dispelled the illusion that we are separate, small individuals and showed that we are all part of the same flowing stream of life and awareness. 1972 takes me to that beautiful place of awareness better than any other year, and I thank you for all your work and words. Keep up the good work! Like Blair Jackson said. "Huge drops of blood formed on the ceiling during the "Spanish Jam" at the Stanley in 1972. This became one of my favourites shows ever of the GD. I discovered it through your beautiful description. I'm just asking myself why there is no official release as Dave's Picks or such?